While called the “Festival of Lights,” Diwali is most importantly a day to become aware of one’s “inner light.” In Hindu philosophy there is an idea of “Atman,” something beyond the body and mind which is pure, infinite and eternal. Today is a celebration of “good” versus “evil”; A day when the light of higher knowledge dispels ignorance. With this awakening comes compassion and joy. The background story and practices vary region to region. Many people celebrate by lighting fireworks and sharing sweets and candies. 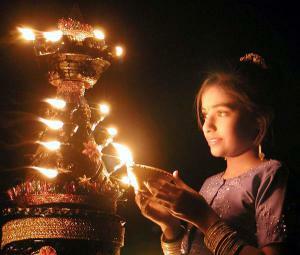 Diwali is a holiday celebrated across a vast array of countries and religions. It is celebrated in India, Nepal, Sri Lanka, Myanmar, Mauritius, Guyana, Trinidad & Tobago, Suriname, Malaysia, Singapore and Fiji, by Hindus, Jains, Sikhs and Buddhists. This informative infographic is from 2012, but I like the information about Diwali it provides and thought of sharing. Source: Metal Gaia, Happy Diwali!, November 13, 2012, http://metal-gaia.com/2012/11/13/happy-diwali/. I have been a big fan of Charles Apple’s work for a long time. I have blogged about him and his work in the past (see “Charles Apple” in my Categories on the right or do a search for “Charles Apple” on my blog). Charles Apple (photo, right) is a longtime news artist, graphics reporter, designer, editor and blogger. 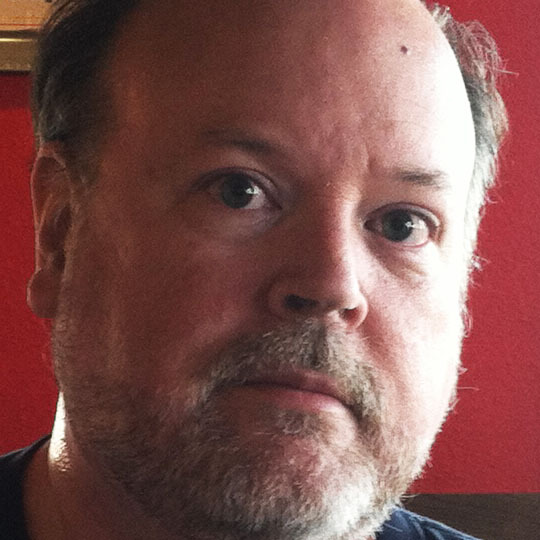 The former graphics director of the Virginian-Pilot and the Des Moines Register, he spent five years as an international consultant and instructor. Currently, he’s Focus page editor of the Orange County Register. I always like to reshare articles and blogs about what NOT to do in regards to data visualization and infographics. This morning, Mr. Apple posted a blog entry titled “Two recent infographic fails you ought to know about.” Charles has always shown a keen eye for detail and accuracy. He is also very reflective of his own work as today’s blog entry shows. I hope you enjoy Mr. Apple’s thoughts as much as I do. Have a great Good Friday and Happy Easter. Source: Charles Apple, Two recent infographic fails you ought to know about, http://www.charlesapple.com, April 18, 2014, http://www.charlesapple.com/2014/04/two-recent-infographic-fails-you-ought-to-know-about/. A couple of charting debacles popped up this week of which you might want to take note. First, Reuters moved this fever chart showing the number of gun deaths in Florida going up after the state enacted its “stand your ground” law in 2005. Just one little problem: The artist — for some unknown reason — elected to build the chart upside down from the usual way a fever chart is drawn. Meaning the chart appears to show the number of gun deaths going down… if you focus on the white territory and consider the red to be the background of the chart. Rule 1: A graphic must be clear. If it’s not clear, then it’s not doing its job and should probably be put out of its misery. Rule 2: It’s OK for a graphic to offer the reader a longer, more complicated view that requires more time spent observing a piece. But that’s not typically the job of a freakin’ one-column graphic. This graphic fails all three: It’s not immediately clear — at least to many readers — and it’s a small graphic. So it has no business getting fancy. If the artist had a reason for turning it upside down, that reason eludes me. We debated this and decided I was right to flip the map — This time. I can’t imagine too many times we’d ever want to run a map with the north arrow pointing down.And, y’know, perhaps we did the wrong thing. Another editor might have made a different choice.But the point is: We made a conscious decision here to let the map support the narrative. I don’t know what point Reuters was making with its upside-down fever chart. Whatever it was, it’s not apparent to me.It’s OK to make unusual choices. Just make sure your data is clear, your story is clear and readers don’t walk way from your piece puzzled as hell. WHEN IS A MAP NOT A MAP? This seems like a good time to present the other infographics debacle this week: This one is by NBC News. Oh, dear. I was just talking about using a map when the map wasn’t the most important element.What we have here is another fever chart, but this one has been pasted inside a map of the U.S. This has a number of effects that harm the greater good we do by presenting the data in the first place:Fever charts (and pie charts and bar charts and most other charts, for that matter) are all about showing proportions. If the proportions get screwed up — by, say, varying the widths of your bars or by covering up part of the chart — then the reader can’t make the visual comparisons you’re asking her to make.And that’s the case here: We see territory marked as “Asian” in the upper left of the chart and also at the upper right. But where is that set of data in 2010? I’m guessing it’s there, but it’s hidden outside the area of the map. Rule 4: If you’re going to hide important parts of your chart, then your chart is no good. And, yes, it should be put out of its misery. The data is displayed over a map. What is the artist trying to tell us? Where white people live in the U.S.? That Hispanics only live near Canada and Asians in Washington State and New England?No, the map is merely a decorative element. It has nothing at all to do with the data. Rule 5: If you don’t need an element to tell your story, then eliminate it. Or I will. Rule 6: If your decorative element gets in the way of your story, then not only do I demand you eliminate it, I also insist you come over here so I can smack you upside your head. Rule 7: Don’t use a map if you’re not telling a story that includes some type of data that needs geographical context. Rule 8: Don’t tilt a map or turn it upside down. Not unless you have a good reason. Go here to read more about the perils of rotating maps. This is an important read for anyone who works in the data visualization profession. I ask you to be reflective as you read this. I use myself as an example of what not to do. For the past two years (2013 and 2014), I have submitted an entry into the MicroStrategy World Dashboard Contest. In both years, I was named one of the winners of this competition. I have written about my work and about the competition on this blog. But I did not tell the whole story. I did not mention that my entries were reproductions of the original ideas and designs of other people. I took liberties that, at the time, seemed innocent. As an academic pursuit, I attempted to recreate these originals using a different tool set (in these two cases, MicroStrategy Report Services and the Visualization SDK) to see if it could be done. I spent time trying to develop methods to allow me to recreate the original visualizations almost exactly as their authors had idealize and developed them. I meant no harm, but what I did was wrong. There are lines and sometimes we cross them. There are lines and sometimes we don’t see them. There are lines that are bold and there are lines that are blurry. The line that I crossed appears bold in retrospect but was blurred at the time. I had spent a considerable amount of time developing these visualizations. It is quite possible that I spent more time trying to recreate the original than the author spent developing the original. I know now that this does not matter. I took the ideas and content and submitted it as my own. I am sorry for this and I have learned a great deal as a result. I now want to use this discussion as an example for others. 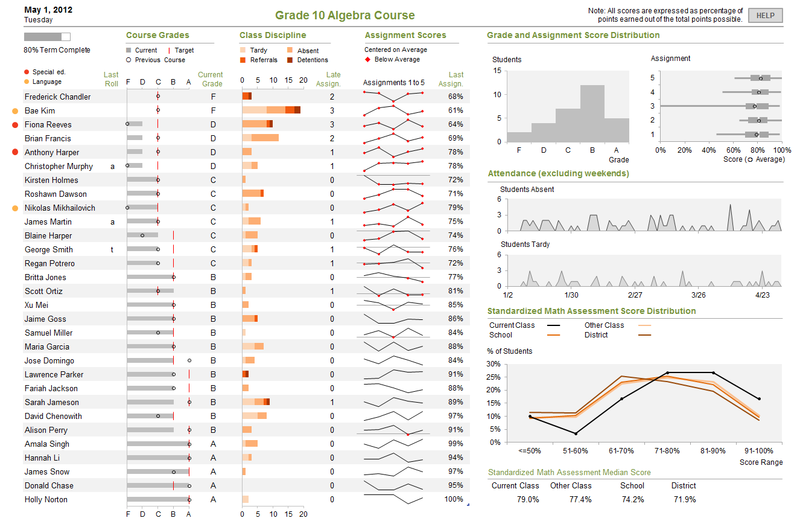 My entry in the 2013 Dashboard Contest was a Student Performance Dashboard, which was based on portions of the top three entries in Stephen Few’s Dashboard Design Contest that was held in late 2012. The majority of my dashboard was based on the original design of the first place winner, Jason Lockwood, who had developed his dashboard in Photoshop. At work, several of us were talking about Jason’s winning entry and how you could probably develop it fairly easily in Tableau, but probably not so easily in MicroStrategy. Being a strong proponent of MicroStrategy, I argued that I could develop that exact dashboard using MicroStrategy’s Report Services and their Visualization SDK. My co-workers challenged me to try it and I began my mission. Unexpectedly, MicroStrategy soon announced their 2013 Dashboard Contest and I thought this would provide me additional motivation by developing the dashboard for their contest. Back to Stephen’s contest. Back in August of 2012, Stephen Few, data visualization evangelist and author of the seminal book, Information Dashboard Design, announced a contest to design a dashboard following best practices and principles. The contest required participants to design the dashboard using student performance and assessment data that Stephen provided. Any graphic design tool (e.g., Photoshop, InDesign and Excel) or BI tool could be used to create the dashboard. To the best of my knowledge (and Stephen’s), none of the 91 participants in the contest used MicroStrategy to create their dashboard. A few of the participants did use Tableau and SAS. This fact alone made me want to create an innovative dashboard to demonstrate the capabilities of MicroStrategy. Below are examples of the first, second and third place winners entries. Below is a screenshot of my entry developed using MicroStrategy and Stephen’s sample data. As you can see by comparing my dashboard to Jason’s. I tried to follow Jason’s entry very closely since my goal was to reproduce his entry as close as possible using MicroStrategy. I have emphasized the word “reproduce” because in my goal to prove the capabilities and functionalities of MicroStrategy, I now realize, in retrospect, that I crossed a line in using Jason’s original idea, design and work to create my dashboard. Now, if I was doing this in my basement for my own edification and learning, that probably would have been o.k. since it was not being viewed by a public audience. However, when I entered the dashboard in MicroStrategy’s contest, albeit developed using my own skills in MicroStrategy, I was presenting someone else’s original ideas and design work without their permission. This, I now understand, was wrong. I have had several e-mail conversations with Professor Alberto Cairo about this. Alberto is considered by many (including me) to be one of the industry’s leading experts on infographics and a person I respect and view as a mentor. I was seeing grey areas in what I had done where Alberto was correctly seeing things more in black and white. Below are some of Alberto’s thoughts on what I did and some analogies he made. I have included his comments completely in quotes to indicate these are his thoughts and have not been modified by me at all. “There are not really clear-cut rules about plagiarism in visualization in infographics, which is a shame. It’s an area in which a lot of thinking and writing needs to be done. But when doing ethical reasoning you can always use analogies. When in doubt, imagine that your graphic is a news article or a research paper. Would it be appropriate if anyone took what you wrote and then just make it interactive without getting permission from the author (you) first? Would it be enough to mention you in a description of what was done? It wouldn’t. Quoting a few lines from someone (in between quotation marks) is fine. Copying and pasting paragraph after paragraph is not, if it’s not without proper permission. Now, I take full responsibility for what I did and apologize to Jason, Shamik, and Joey. I do need to say, my primary purpose was to create recreate cool dashboards or infographics I had seen, in my tool of choice which is MicroStrategy. The key thing I was trying to do was show clients and business partners that I could create the same thing they see in Tableau and Qlikview using the MicroStrategy platform. To continue with Alberto’s thoughts on this, I again include an exact quote of what he said. “I understand it, but copying the layout, the structure, the content, and even the headline and intro copy (on top of everything else) is not the only issue, but also submitting the results to contests with no permission from the original authors, and without mentioning them. Alberto is correct. I would be upset too. 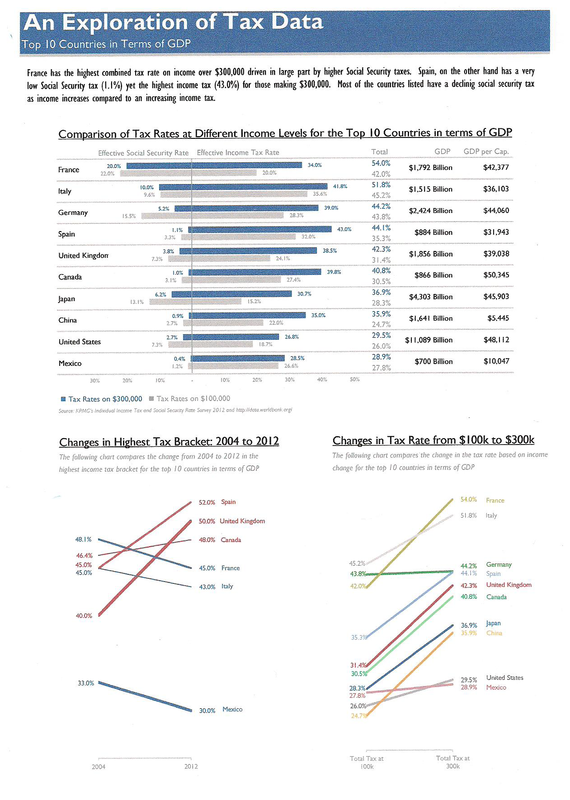 My entry in the 2014 Dashboard Contest was An Exploration of Tax Data. It was based on an original idea, text and design by Jim Uden, one of my classmates in Professor Cairo’s MOOC course on Data Visualization and Infographics. 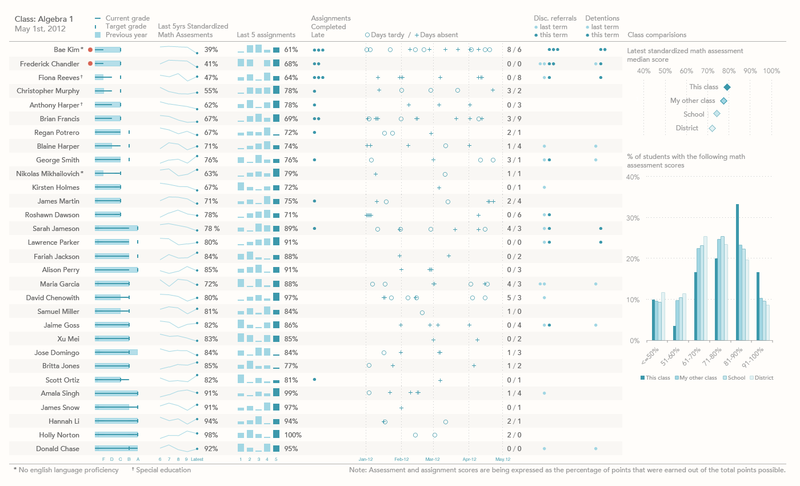 I really liked the An Exploration of Tax Data visualization created by Jim. I liked it so much in fact, that I wanted to make a working example for our development team at work using MicroStrategy. I create a lot of dashboard “templates” for our development team in MicroStrategy, which is our enterprise standard BI tool. So, using Jim’s data, text and format exactly, I created a dashboard in MicroStrategy with some tweaks to it. Below is a screenshot of Jim’s original work. 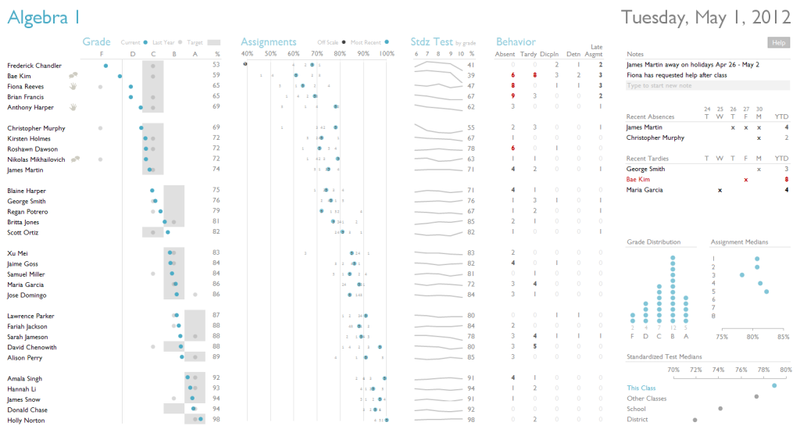 Below is my version created using MicroStrategy Report Services and their Visualization SDK. I used horizontal stacked bar charts instead so that the viewer can visually see how social security and income tax rate add up to the total and explains visually why the countries are ordered the way they are on the dashboard. I also separated out $100K and $300K percentages into separate visuals. In addition, I added the flags of the countries. Now, you don’t see any numbers on the data points in this dashboard. The reason you don’t see them is because they appear when you mouse over a bar where you then see the country, category and the percent value as a tooltip. However, by using Jim’s data, text and design exactly from his original, and without getting his permission first, I again crossed the line. I have emphasized the word “exactly” because in my goal to prove the capabilities and functionalities of MicroStrategy, I now realize again in retrospect, that I crossed a line in using Jim’s original idea, data, text, design and work to create my dashboard. I again take full responsibility for what I did and apologize to Jim. I approached Professor Cairo again with another question: What are the ground rules for the use of another person’s materials. For instance, a lot of blogs (including mine) will post an infographic they have seen in a magazine or on a site like visual.ly and discuss it. Are we plagiarizing if we cite the author, magazine, etc.? I feel this was an important topic for me to discuss and clear my conscience. I would not be honest if I did not say this was very difficult and embarrassing to write. Professor Cairo reminded me it takes courage to do this. Maybe so, but I don’t feel very courageous at the moment. Next year, if MicroStrategy has another Dashboard contest, I plan to create the entire thing from scratch. Data, text, design, colors, fonts, etc. It will be from my vision only. However, over the next year, I think this is an important topic to discuss in our data visualization community with social media like Facebook, Twitter, Reddit, Instagram, Tumblr, etc. growing in use every day. At what point have we crossed the line? Or are they blurred lines? I would love to hear your thoughts on this and opinions. I may not like what I will hear, but I will hear and reflect on what you have to say. Thank you for reading this very long post. I hope you see the value in it as much as I do.